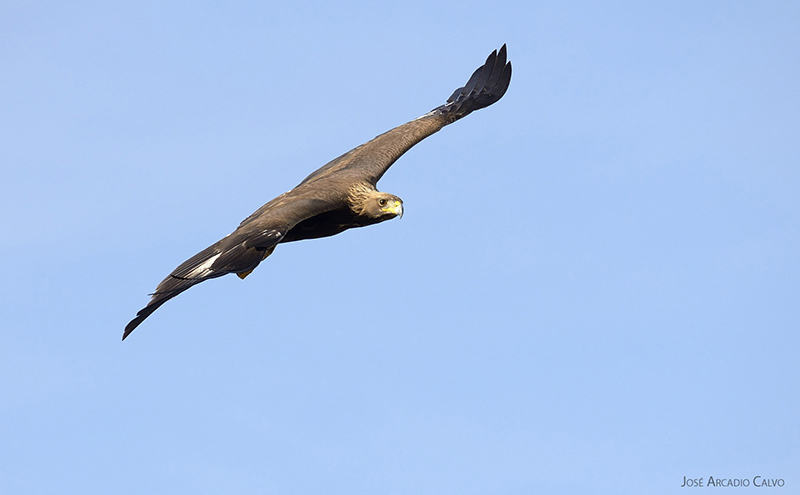 It is a large eagle, that reaches 75-90 cm in length and has a wingspan of around 190-227 cm. Males weigh between 2.800-4.550gr. whilst females can weight around 3.630-6.665 gr. Adults have a brown and uniform plumage with a tawny yellowish head. The juveniles have an equally uniform plumage of dark brown feathers which covers their whole body, with large white patches on their wings and along the base of the tail which can be very marked and visible in some individuals, gradually they lose these colours as they acquire their adult plumage at around 4-5 years of age. They have a large, strong and curved beak with large talons. They carry out eye-catching on-flight stops accompanied by a high pitched call which can be heard from great distances. Habitat: They occupy diverse habitats, with preference for mountainous areas and riverside ledges, avoiding large forested areas. The average height at which they nest is 950m, although it can range from 160m to 2.150m. The majority of nests are built upon rocky outcrops and crags, just 10% of them nests on trees, this percentage however varies regionally. 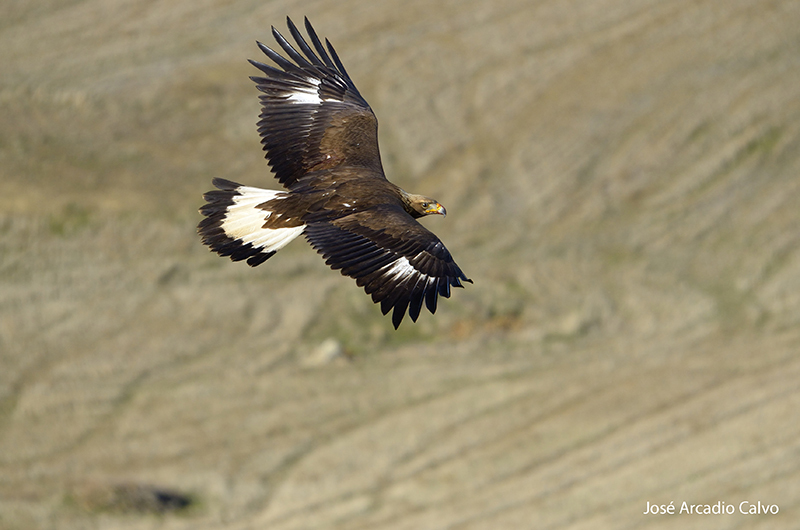 In Spain the breeding pairs are sedentary whilst the juveniles present dispersive movements. Nutrition: Large trophic array including mammals (lagomorphs), birds (partridges and doves) and reptiles (lizards and snakes). 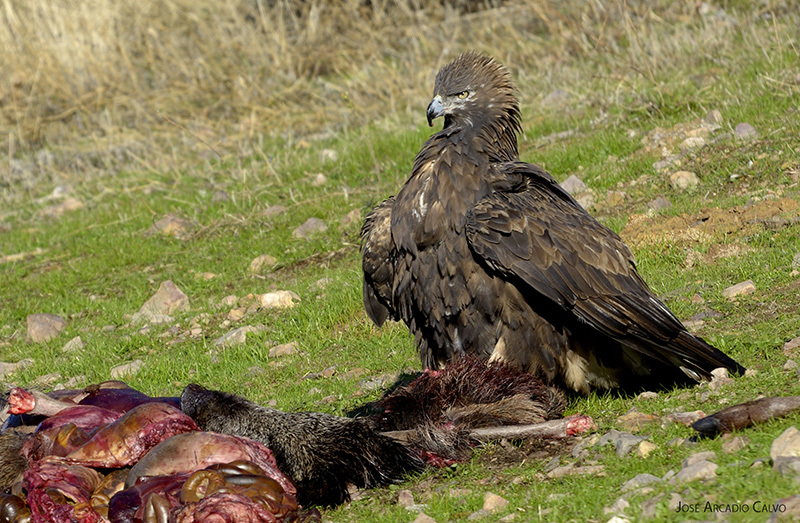 Although it is an active predator, it isn’t strange to observe them eating from carrion either from livestock or wildlife. Daily trophic needs: Estimated at 300 g/day for an adult individual. Reproduction: For their nests they choose tranquil areas with little human interference. Constructing large nests 1,5 m in diameter, mainly on rocky ledges, although occasionally they can also build them on trees. They lay between 1-3 eggs around February and March and the incubation lasts for 41-45 days. The chicks stay in the nest between 65 and 80 days. They remain dependant for another three months after leaving the nest. Polytypic species with six recognized subspecies, with Holartic distribution, between 70°N and 20°N. It has its largest populations in the eastern Palearctic and western North America. The subspecies which breeds in our country is A. c. homeyeri which is distributed around the Iberian Peninsula, Northern Africa (including the southern Sahara) large islands of the Mediterranean, Middle East and Arabia, all the way to the Caucasus, Iran and eastern Uzbekistan; and possibly in Ethiopia. In the rest of Europe it is the subspecies A. c. chrysaetos distributed from the centre and northeast of the continent all the way to western and central Siberia and Altai Mountains range. In Spain it occupies the major mountain ranges. In Castile y Leon it is found in the region’s mountains, the Cantabrian range, Iberian system, Central System, and river valleys (Duero, Ebro, Riaza, Duratón, Huebra, etc). The global population is estimated at around 170.000 individuals; With around 6.000-12.000 pairs in Europe; of which between 1.500 and 1.800 are in Spain. 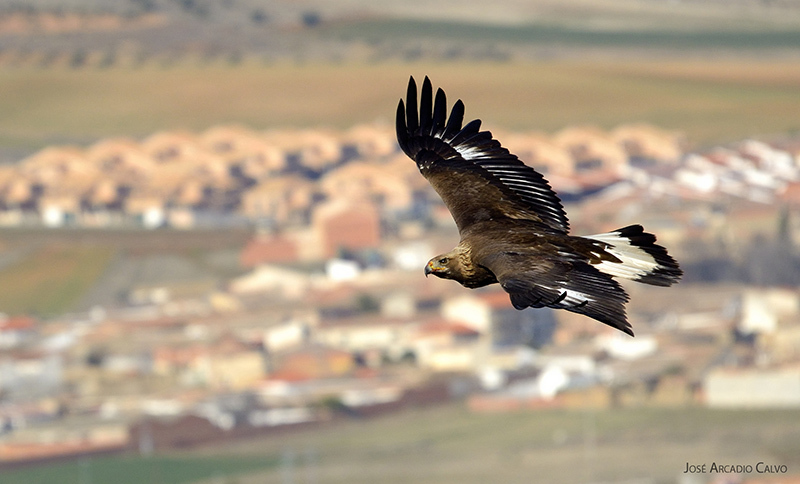 In Castile & Leon in 2008 between 234 and 258 reproductive pairs were censed. Hunting and the disruption of their habitat are the most serious threats. Equally as important are both electrocutions and collisions at wind farms.